Prime Minister's statement indicates Israel narrowly averted an unprecedented slaughter of civilians, raises crisis of trust with residents. In a statement Tuesday, Prime Minister Binyamin Netanyahu lent credence to reports that Hamas had planned a large-scale operation against Israeli civilians, in which its terrorists would have emerged simultaneously and in large numbers from numerous tunnels dug into Israel. The terrorists would then have been able to carry out a large scale massacre of civilians, and to abduct other civilians back into Gaza through the tunnels. The reports surfaced shortly after the start of the ground incursion into Gaza, and were said to have been based on confessions made by Hamas terrorists taken captive. Unverified reports claim the captives said that Hamas was timing the incursion for Rosh Hashana, the Jewish New Year. IDF officials have been saying that the IDF knew about the terror tunnel threat when the operation began. However, had the IDF been fully aware of the extent of the threat, it undoubtedly would have mentioned the demolition of the tunnels as a major war aim from the outset. In reality, the initial stated aims related only to Hamas's rockets and did not mention the tunnels. The tunnels became a major goal only after Israel was repeatedly surprised by terrorist squads that emerged from tunnels. Justice Minister Tzipi Livni (Hatnua) explained on July 18 why she agreed to a ceasefire four days earlier, even though the IDF had not yet managed to destroy the Hamas tunnels network, but the explanation only seemed to cast further doubt on the seriousness in which the government regarded the tunnel threat. A Channel Two news anchor asked Livni over the weekend how it developed that the government basically agreed to a ceasefire on July 15, while on two days later it suddenly "remembered" that "the tunnels are a strategic problem that must be urgently taken care of." Livni answered, "First of all, in truth the tunnels aren't something new…. There is a difference between a problem that still hasn't taken place and you still don't see it inside the territory of the State of Israel, [and between] that infiltration [from the tunnel] at Sufa that basically meant that it's not only a tunnel, but that Hamas continues and intends to use them inside Israel against the citizens of Israel." On July 19, one day after Livni's interview, nine terrorists penetrated Israel through a tunnel near the kibbutz community of Be'eri. Two IDF soldiers and one terrorist were killed before the terrorists escaped back to Gaza. On July 21, terrorists entered Israel through a tunnel near the kibbutzim Erez and Nir Am. They fired an anti-tank missile that killed four IDF soldiers. At least ten terrorists were killed. On July 28, terrorists entered Israeli territory through a tunnel that opened up into the area near kibbutz Nahal Oz. They attacked an IDF pillbox position, killing five soldiers, and made it back to the tunnel. One terrorist was reported killed in that incident. The IDF's version of this event has also not stood up to scrutiny. While it claims that the IDF force thwarted an attempt by the terrorists to kill and/or abduct civilians in Nahal Oz, Hamas's own video of the incident clearly shows that the terrorists surprised the soldiers in the pillbox, and that they were the ones who initiated the contact. Later evidence showed that the tunnel these terrorists used was equipped with motorcycles, too. These would have made it easy for them to rapidly cover the distance from the tunnel's shaft in Israel to Kibbutz Nahal Oz, had they chosen to use them. It seems, however, that with the IDF inside Gaza, they preferred to opt for a military target rather than incur the full wrath of the Israeli public with a massacre of civilians. All of this leaves Israelis with a disturbing picture of events, made worse by the IDF's apparent tendency to cover up its tunnel-related failures. The IDF certainly knew that some tunnels into Israel existed, ahead of the Gaza incursion: five Hamas terrorists were killed on July 8 in an explosion inside one such tunnel, near Kerem Shalom, after the IDF became aware of its existence. However, there is no evidence to suggest that the IDF treated the tunnels as an extremely serious threat, believed that there were more than 30 such tunnels waiting to be used, or imagined the kind of massacre that Netanyahu described Tuesday – and there is a lot of evidence to suggest the opposite. For one thing, the IDF had told the Gaza Belt communities in recent months that it will cut funding for community security coordinators, after an inexplicable decision to remove IDF guards from the communities. This decision has now reportedly been reversed. Had it been carried out, the communities would have had absolutely no ability to fend off a terrorist incursion, and even their ability to notify the IDF in real time of such an event would have been in doubt. A deep chasm of mistrust has opened up between the Gaza Belt residents and the IDF in the matter of the tunnel threat. Many residents feel that the IDF misled them and failed to guard their lives. There are now numerous reports about residents who refuse to return to their communities until the issues are resolved, despite the fact that the military has said it is now safe to go back. Judging by media reports, most of these appear to be mothers, who opted to relocate with their children after the tunnel threat was exposed, and are hesitant about returning. 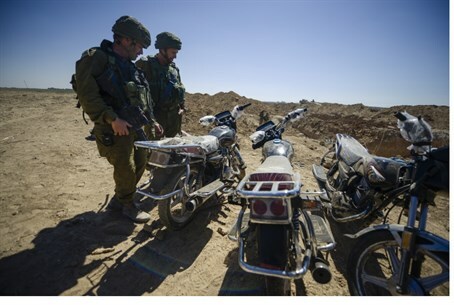 Arutz Sheva asked the IDF to respond to this report but has yet to receive a reaction. We will publish the response as soon as it is received.